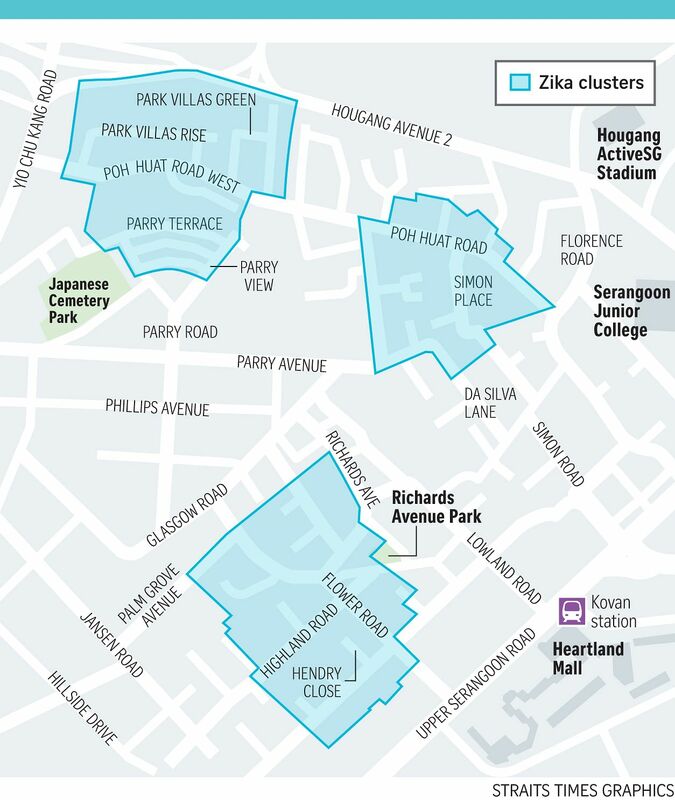 Two new cases of locally transmitted Zika virus infections have been found at the Poh Huat Terrace/Terrasse Lane area, in the neighbourhood of two other clusters discovered recently. The National Environment Agency (NEA) yesterday said both new cases are residents in the vicinity, and the new cluster has been notified. Vector control operations and outreach efforts have started in the new cluster, said NEA, which urged the community to take action. This comes barely a week after the second Zika cluster of the year was found nearby at Flower Road/ Hendry Close, in the Kovan area. Meanwhile, the cluster at Simon Place, off Poh Huat Road, which was the first cluster found this year, closed yesterday and will be kept under surveillance, said NEA. It added that "residents and stakeholders are urged to maintain vigilance and continue to eliminate mosquito-breeding habitats, as there could still be asymptomatic or mild, undiagnosed cases which might result in further transmission". NEA is also continuing with vector control operations in the Flower Road/Hendry Close cluster. Outreach efforts are ongoing, including distributing information leaflets and insect repellents. Residents are requested to allow NEA officers to carry out inspections and indoor spraying of their homes too. Most infected people do not develop symptoms, heightening the risk of a "resurgence as it may take some time before a reintroduced Zika virus is detected", said NEA. Members of the public should seek medical attention if they are unwell, especially with symptoms such as fever and rash. They should inform their doctors of the location of their residence and workplace.